Donna Nook National Nature Reserve near Louth in Lincolnshire is an amazing place to visit to see Grey Seals and their pups. 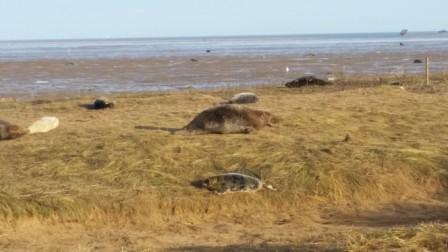 The grey seals come on to the beach during November and December to give birth to pups and to mate. Because so many people go to see the seals, the adults and their pups are used to humans so come very close to the viewing area and some pups even lie against the fence. No dogs are allowed on the Nature Reserve. Also, keep an eye on children and make sure they don’t try to stroke the seals as they have sharp teeth and give a nasty bite. Last year we went to see the grey seals at the beginning of December, if you go at the weekend I would advise aiming to get there by 10 am. We were able to have a good view as we walked from one car park towards the other but on the return walk back it was getting much busier. There are lots of information boards telling you about the grey seals and boards with multiple choice questions that you guess and then lift the flap to find the answer. Spaced out along the viewing area there are volunteer wardens, who are very knowledgeable and helpful if you want to ask questions about the seals. There is also a little gift shop where you can buy grey seal keyrings and pictures. This year (2017) the first grey seal pup was born on 13th October. 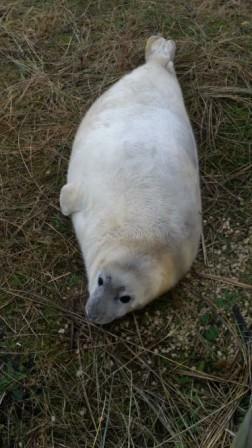 When the grey seal pups are born they have a white fluffy coat to keep them warm. The pups feed on their mother’s milk for 18-21 days, gaining about 2kg of weight per day. The grey seal pups start to lose their fluffy white coat around 3 to 4 weeks when they are weaned. 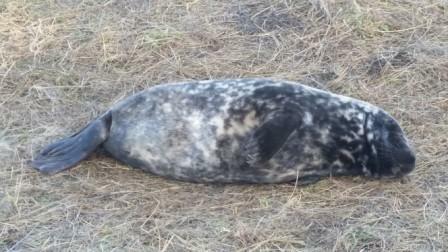 For weekly updates of the number of adult seals and pups follow the Donna Nook Warden Facebook page. There are 2 car parks. 1 which is concrete and run by the local authority but will be full unless you get there early. The second one is a grass field and you pay at the gate, there are also portaloos at this car park. There is also a catering van serving hot drinks, burgers, bacon baps and cakes at the local authority car park. Be careful and considerate to other drivers, after you turn off the main road, as the roads are narrow and only suitable for one car at a time in places. 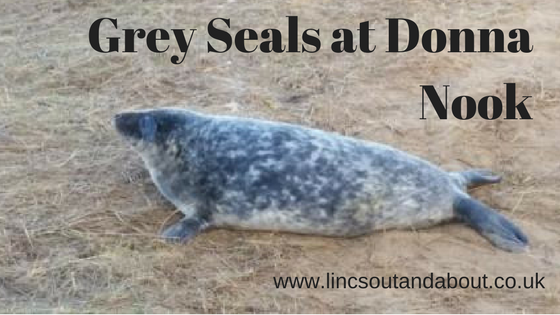 To find out more about grey seals and visiting Donna Nook take a look at the Lincolnshire Wildlife Trust’s website the postcode to use to get to Donna Nook National Nature Reserve is LN11 7PD although this doesn’t take you directly to the Nature Reserve, so follow the signs. This entry was posted in Coast, Things to do, Walking, Wildlife & Countryside and tagged Coast, Countryside, Donna Nook, Grey seals, Lincolnshire, National Nature Reserve, Wildlife on November 13, 2017 by admin.